Boxes of old slides can be full of surprises. 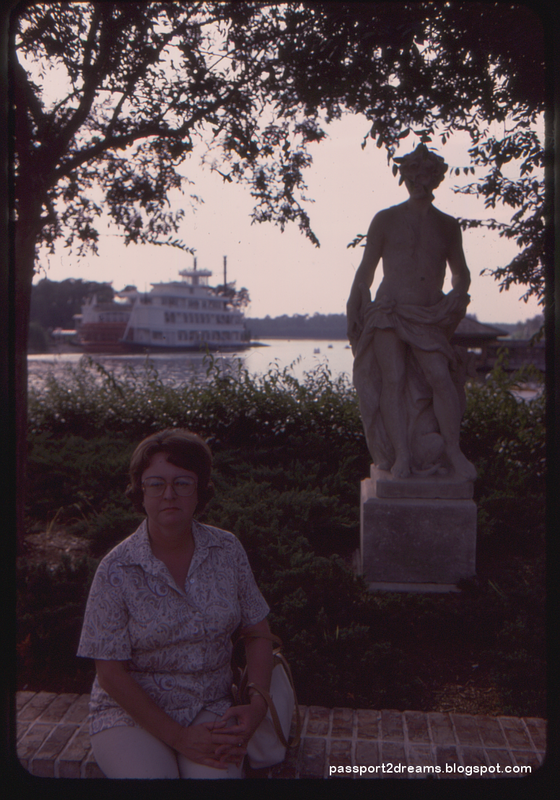 I tend to decide to purchase if the seller happens to scan an unusual view, but even the least ambitious amateur photographers of the 70s tended to take a few weird ones. Almost everyone at some point was compelled to break the flash photography rule or take some blurry photos from the train. 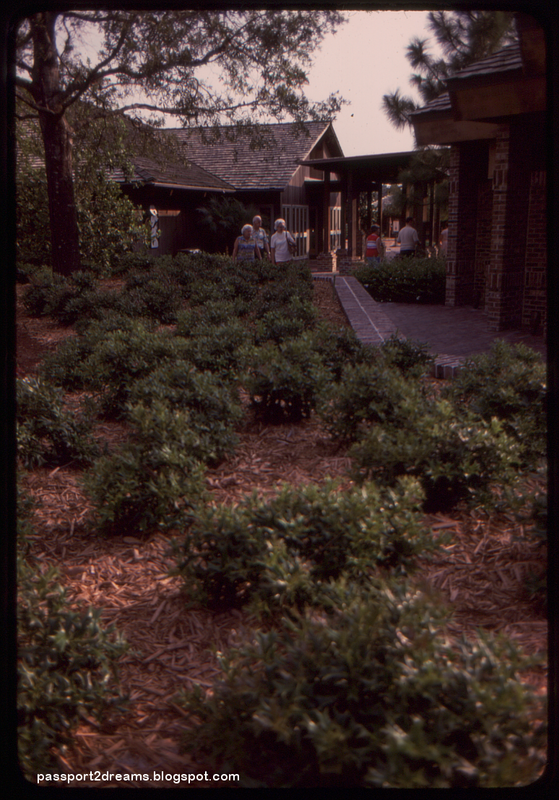 So I was pleased to find mixed into the 1978 slides a good number of photos of the Walt Disney World Village. Amateur photos of the Village are exceptionally rare; and while some of the most beautiful professional photos Disney ever published are of the Village, it's valuable to see another view of the place. 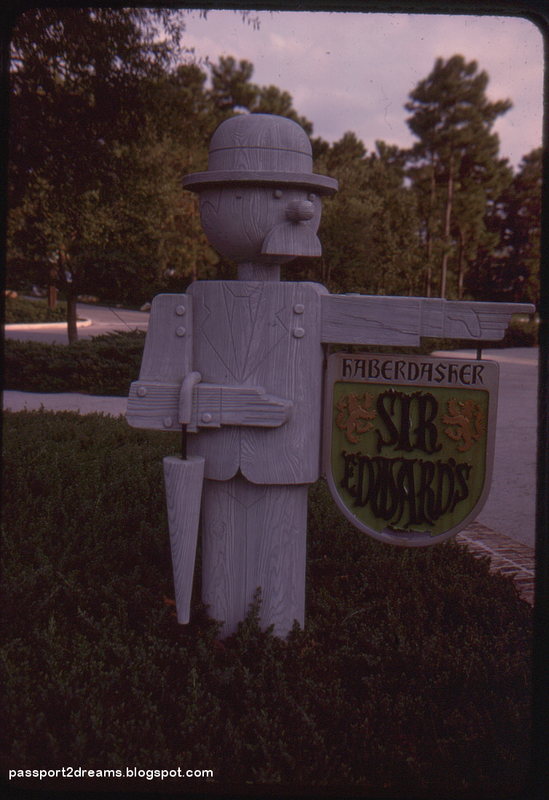 Each shop outside the Village had a beautiful handmade sign, and maybe the most distinctive was for Sir Edward's Haberdasher. 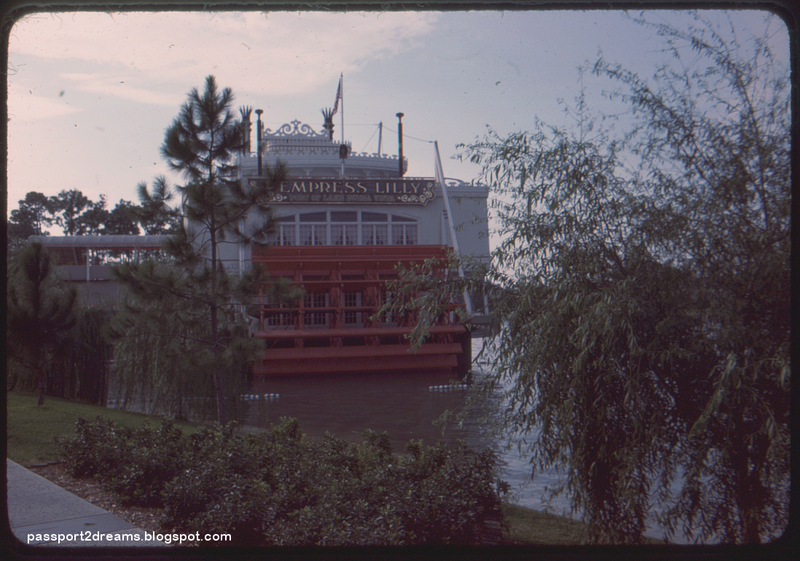 Here's the Empress Lilly from the boat marina. Captain Jack's sits off to the right. This photo, besides affording a glimpse of the Village Marina's old craftwork lanterns, shows how very different the effect of the Lilly once was. Situated where it is, surrounded by trees with nothing but a vast Florida waterway stretching out ahead of it, the effect is beautifully romantic. 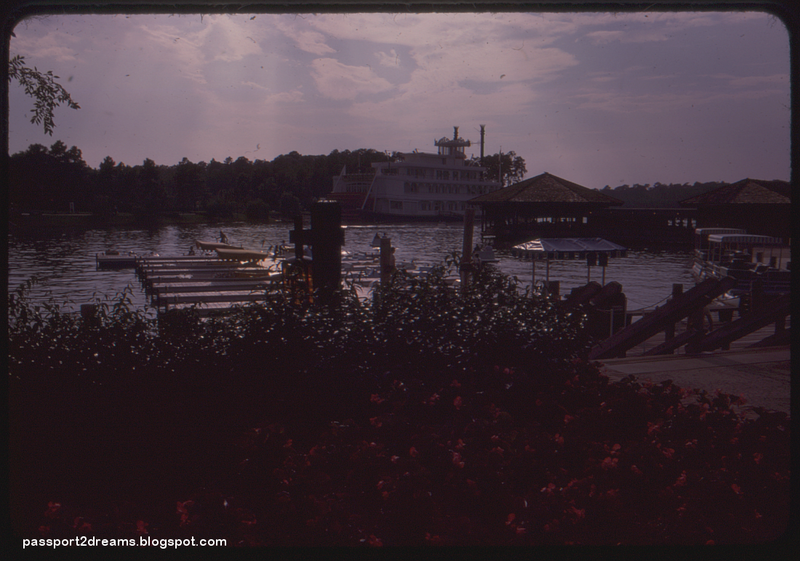 This was lost in 1989 when all of those trees were taken down for Pleasure Island. The original winding, pastoral walk to the Lilly. Not even the waterwheel remains today. Our lady friend returns from last week, less artfully composed. 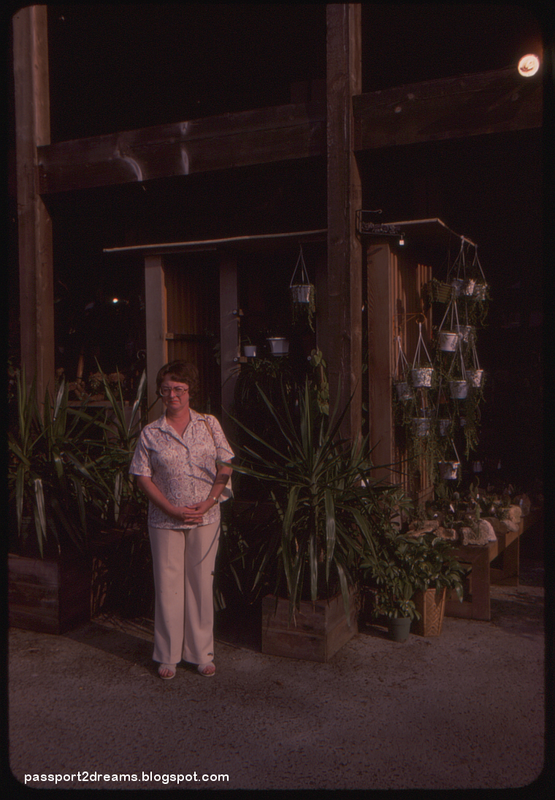 She's standing in front of the Pottery Chalet, which was a sort of housewares super store. The front area as well as a rear interior courtyard was all pots and plants. In the 80s it because the Christmas Chalet and was levelled in the 1990s. World of Disney stands there now. Entering the Village from the Parking Lot. This appears to be the back of Sir Edwards's, meaning that's the bathrooms on the right. Originally, many of the buildings in the Village were connected by airy verandas and covered walkways like those seen here, allowing products displays to spill outside the confines of the store. The design of the Village was executed by a young team inside WED and is little heralded, but I think the architecture and emphasis on natural colors works beautifully well in the natural Florida environment. Walt Disney World, and the Village in particular, was instrumental in shaping a stronger sense of food culture and sophistication in Orlando. 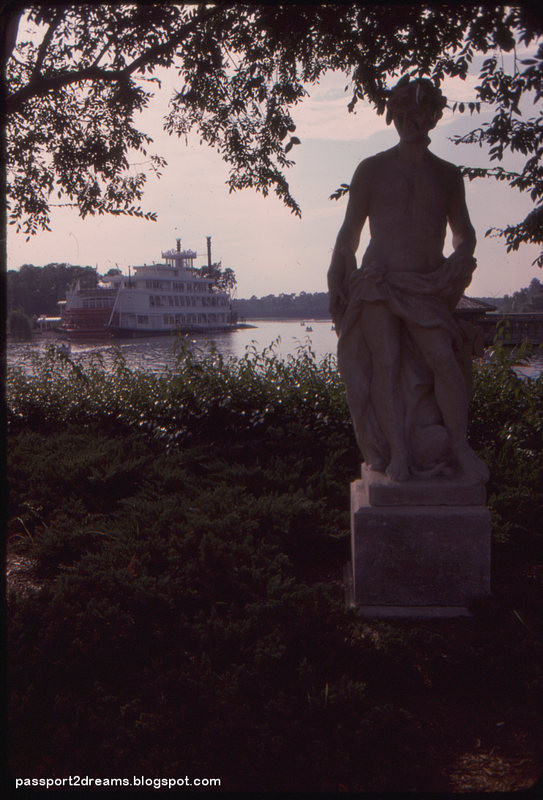 In the late 60s, just about the best you could get in Orlando was Maison et Jardin in Altamonte Springs and the Columbia downtown. Orlando was a takeout-and-deli town. Disney, simply by showing up and opening things like gulf coast-inspired continental dining rooms, the Gourmet Pantry where one could buy Kobe beef, and French-Colonial dinner palaces with floor shows changed the local food culture forever. Even today, Orlando boasts an amazing variety of food experiences. Whatever you want, you can get it, and usually in very high quality. This is probably, more than anything, the thing that may not have happened in quite the same way had Walt Disney lived. Walt liked good food, but his limited palette and eating habits always embarrassed his cronies like Card Walker and Donn Tatum. Those guys were the fine dining mavens and they are the ones who brought that expectation with them from Los Angeles. 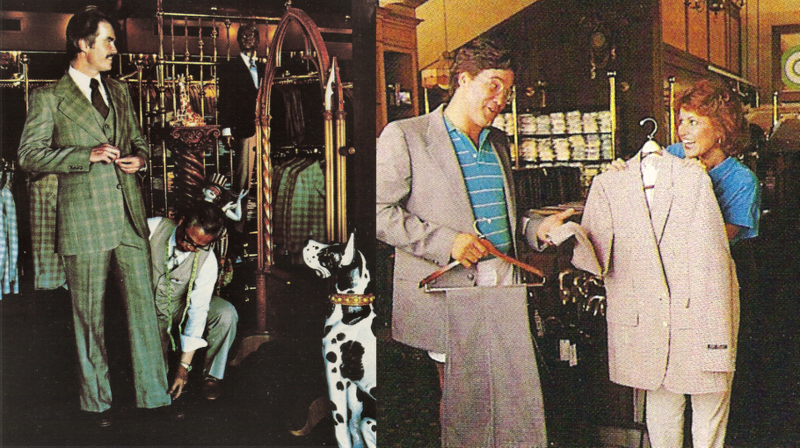 The Village opened the first serious wine shop in Orlando: the Vintage Cellar, where Art of Disney is now. They imported the best and brightest available to a swamp, no matter the cost. It was part of the show to the Disney people; to a nascent Orlando food scene it was a gift from God. The demand for wine at this store was so great that Disney began to offer case discounts. They hired an in-house wine expert to give weekend lectures and tastings, and they sent out monthly fliers to the "Cellar Dwellers" club, announcing new shipments and vintages - with quantity limits. All of these things come rushing to me when I see photos like this of the Village. It's just one example of many. It's not easy to remember that Orlando was once a sleepy town like Ocala is today - incidentally, another place Disney was interested in moving to in the 60s. It was a cow town with an urban center. People liked it that way. Disney's arrival could not have been more disastrous to old Orlando had it been an asteroid. Walt Disney World may be a cultural juggernaut and a base commercial operation, but it had ambition and beauty, and it changed people's lives. Disney may have abandoned EPCOT, but they did shape a city with projects like the Contemporary, the Village, and World Showcase. I wish Disney had those ambitions today. For a minute there I thought you had Photoshopped that woman out of the last picture. I grew up about 30 minutes from the Village. We always called it lake Buena Vista when I was younger. I loved going there in the late 70's early 80's. Always felt so distant from the park. Was its own little world.